Download our Fire Extinguisher Brochure! 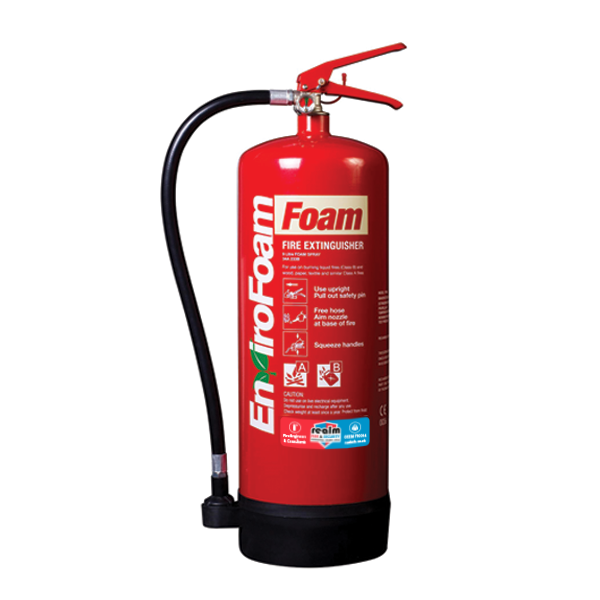 Water extinguishers still remain a popular choice for Class “A” fire risks, they come with an impressive 5-year realm guarantee and are Kite marked to BS EN3 Standard. Water – the economical, reliable choice for Class “A” fires. Foam is always an excellent choice for Class A and B fires. The increasingly popular 6-litre model combines lightweight, compact design and a 13A/144B fire rating. 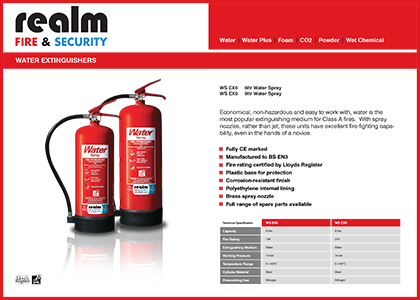 All realm fire extinguishers come with an impressive 5–year guarantee and are kite marked to BS EN3 Standard. ABC Powder is a multi-purpose extinguishing medium with excellent flame knock-down properties. models that include transport brackets and are ideal for transport applications. The 9kg model boasts an outstanding 55A 233B fire rating. All Realm Fire extinguishers are guaranteed for 5 years. Suitable for both electrical and flammable liquid fires, CO2 is non-damaging to electrical equipment and machinery. This C02 fire extinguisher is probably the most robust available in the UK. With aluminium ‘squat’ bodies, they combine superior aesthetics with light weight for ease of handling. The 5kg model comes with an 89B fire rating – probably the highest available in the UK. 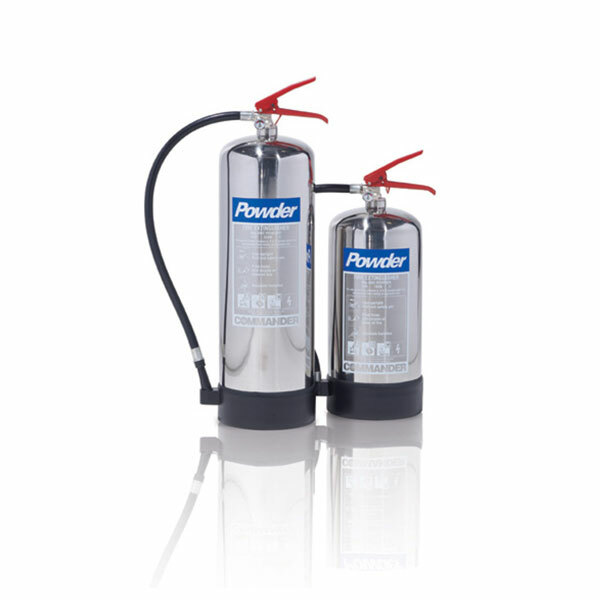 Supplied with nonconductive discharge horns, these extinguishers are ideal for workshop, industrial and office environments. High-gloss polished stainless steel cylinders for use where appearance is important. This range is resistant to corrosion and supplied with a plastic protection base. Prestigious buildings and environments very aesthetics are paramount, these extinguishers fit in very nicely into almost any situation, whilst not looking out of place. 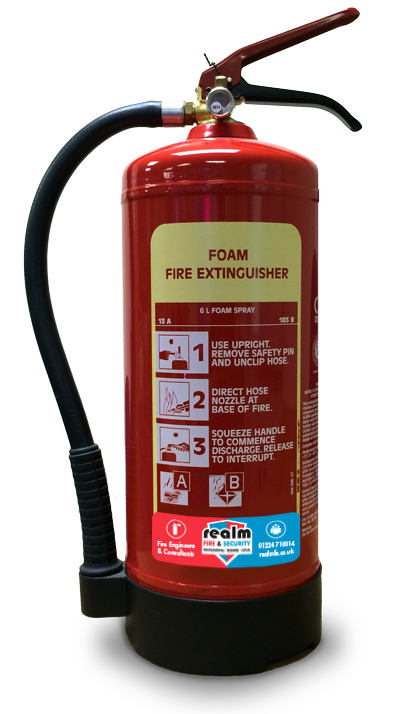 Realm Fire & Security also offer a range of accessories that you need for your fire extinguishers. You can see a list of these accessories by clicking the link below.